She is our newest tester and model. She joined our modeling team about 1 week after Rosy's passing. Like Rosy, Marie is a very small cat. Even after gaining weight she still weighs less than 7 pounds. 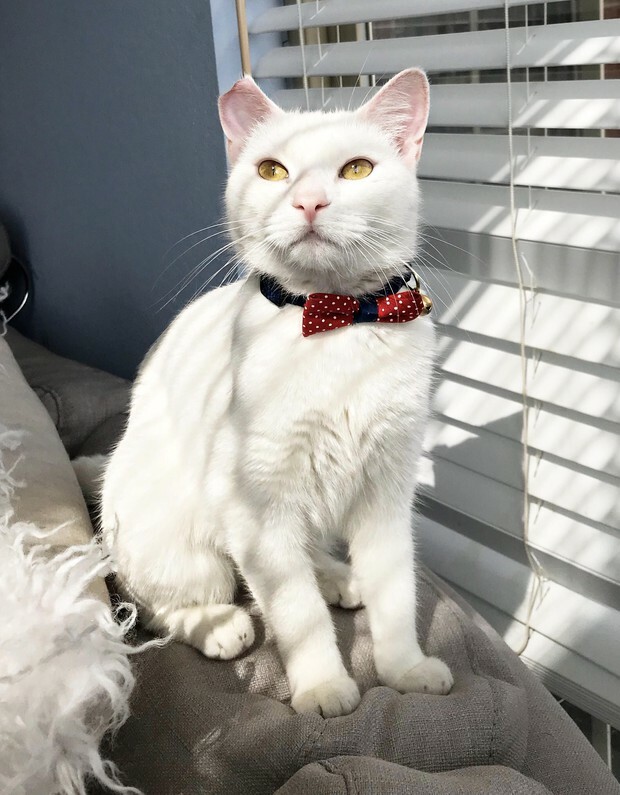 January 15th I returned home from a day at the office to find a tiny emaciated white cat with signs of frostbite on her right ear, the tip of her nose and the bottoms of her feet wandering around our home. When I went to check the mail I noticed her and called out to her - she came running. What can I say, I'm a magnet for cats. We took her to our vet the next morning. We were afraid she wasn't going to make it. In addition to her suffering from malnutrition and frostbite, at some point in her young life she'd been hit by a car or suffered some sort of traumatic injury as her left rib cage is slightly collapsed from a severe blow. With plenty of healthy food and TLC, Marie has pulled through and is as healthy as she can be given the trauma she's been through. Marie's specific Cattitude - affectionate on her terms, ground huger, prefers scratching on Dura Carpet and Sisal Mat, prefers sleeping in a condo at ground level, very playful and aggressive with our toys. We are still socializing Marie, so she's not yet made her debut as a packaging model. You see her on our Instagram and Facebook pages.